Introducing The Sega to ATX Power Supply Adapter Kit Sold Exclusively By Highway Entertainment! We are very excited to introduce the Sega to ATX Power Supply Adapter Kit, an innovative new product which allows you to replace power supplies in older model Sega arcade machines with a generic ATX power supply. This product is a two board kit created by 2000 Computers & Networks Pty Ltd and is compatible with Sega Model 1 and Model 3 power supplies, and arcade machines such as Virtua Fighter, Manxx TT, Sega Rally, Fighter Vipers and more! 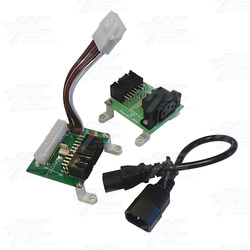 The Sega to ATX Power Supply Adapter Kit is easy to install, you simply connect the kit to the original harness in the machine. There is no modification of the original machine is needed. The only additional hardware required for the Sega Power Supply Adapter Kit is a good quality ATX 20pin or 24pin Power Supply. The Sega to ATX Power Supply Adapter Kits are being sold exclusively by Highway Entertainment and our Hong Kong parts division Arcade Spare Parts. These units are available for immediate shipping, however please note that there is only a limited supply for this initial offer. The next production of will depend on the level of interest in the product. To place an order or for more information, please follow this link. Shonavee Simpson (SS): Can you tell me about your company? 2000 Computers & Networks Pty Ltd (2000): 2000 Computers & Networks Pty Ltd provides quality hosting services including Website Hosting, Email Hosting, Microsoft Exchange Email Hosting, Shadow Protect Backup Hosting and Dedicated and Virtual Server Hosting and Co-Location. We are also supply our customers with Fibre Optic, ADSL and Bonded DSL Connectivity. 2000 Computers & Networks Pty Ltd also provides Linux and Windows server administration, networking support, troubleshooting and design as well as hardware from leading vendors such as Cisco, Fortinet, HP and Intel to name a few. (SS): Is this available for shipping immediately? If not, when? (2000): Yes there is limited quantity available immediately, and larger quantities available with ETA to be determined based on interest. (SS): What are the full ranges of machines this adaptor can suit? Please provide some examples. (2000): The adaptor will replace all Sega Model 1 and Model 3 power supplies. There is a very long list of games that used this system, including: Virtua Racing, Star Wars Arcade, Virtua Fighter, Wing War, Sega VR-1, Dennoo Senki Net Merc, Virtua Fighter 2, Manx TT Superbikes, Sega Rally Championship, Sega Rally Pro Drivin’, Sky Target, Virtua Cop 2, Dead or Alive, Dynamite Baseball, Dynamite Cop, Pilot Kids, Virtua Fighter 2.1, Motor Raid, Zero Gunner, Boat Race GP, Virtua Fighter 3, Virtua Fighter 3tb, Sega Bass Fishing/Get Bass, Scud Race, Le Mans 24, Scud Race Plus, Harley Davidson & L.A. Riders, Fighting Vipers 2, Sega Rally 2, Ski Champ, Daytona USA 2, Daytona USA 2: Power Edition, Dirt Devils, L.A. Machineguns, Spike Out, The Lost World: Jurassic Park, The Lost World: Jurassic Park Special, Virtua Striker 2, Virtua Striker 2 Version ’98, Virtual-On Oratorio Tangram, Star Wars Trilogy Arcade, The Ocean Hunter, Emergency Call Ambulance, Magical Truck Adventure, Spike out Final Edition. It is also suitable for some Blast City cabinets that use the same wiring style harness. However some wiring will be required for the Service Switch and Test Switch and possibly the audio. (SS): How do you connect the adapter to a machine? (2000): The adapter connects to the original harness in the machine. No modification of the original machine is required. The only additional hardware required is a good quality ATX 20pin or 24pin Power Supply. (SS): Dimensions and weight of the adapter? (2000): Packaged, the units are approximately 200 x 100 x 50mm and weigh in at 2kg. (SS): Do you have images of the adapter? (2000): Please look at http://cwispy.com/sega-psu-to-atx-psu-adapter/ for more images and descriptions on the units. I can take some other photo's if you require them.